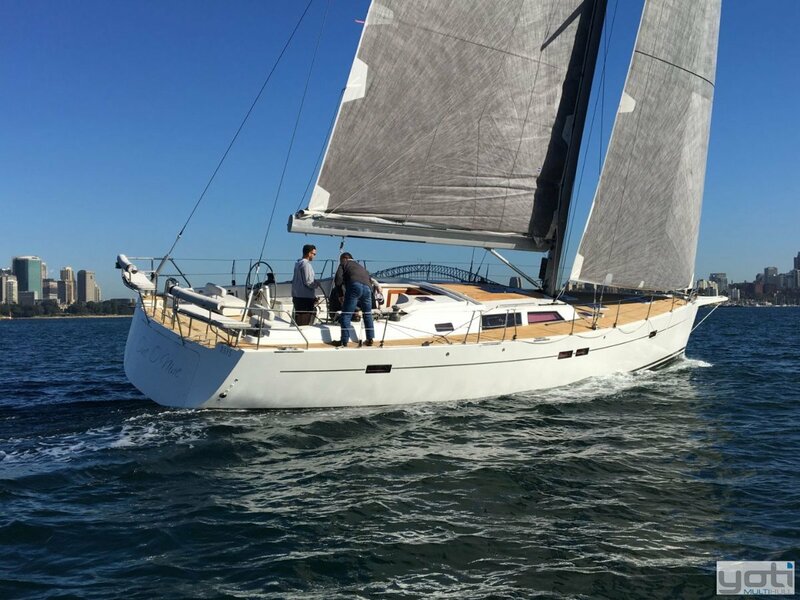 Commissioned in Sydney by Windcraft in 2009,'One O Nine' is an immaculate Hanse 540e exclusively For Sale with YOTI. 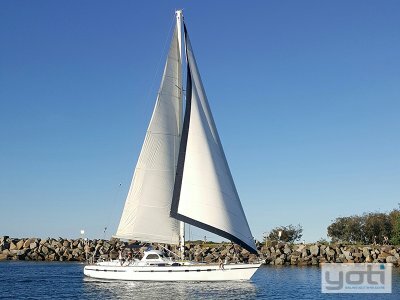 Immaculately maintained and constantly upgraded since new, she has been lovingly cared for by the one family since launch. 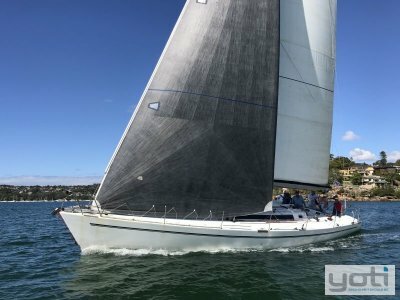 In 2015 she was completely re-fitted to arguably become one of the finest 50'-60' cruiser racers in Australia. 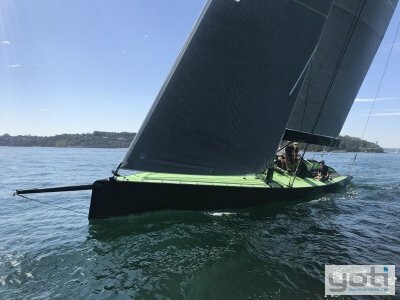 With a new Carbon mast and Carbon Park Avenue boom, new Carbon Hood working and running sails, new mainsheet pedestal housing a new electric winch and a Carbon Bow sprit for the new Asymmetric Spinnakers, she is literally a turn key proposition. 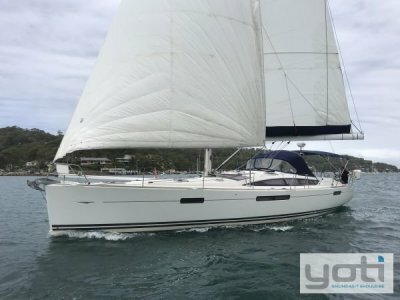 Presenting like a new yacht with new B&G sailing instruments she will suit the most fastidious of buyer looking for a safe, capable Bluewater cruising yacht with surprising performance and the ability to compete in most fleets in Australia. For the opportunity to inspect please Tim Vine for more details. GRP with full teak decks. Engine serviced June 2017. Twin steering wheels. Fisher Panda 8Kva generator (Serviced June 2017). 300L fuel with day tank and transfer pump. Roto moulded tanks. 800L in 2 x stainless steel tanks. Full 'walk over' deck covers, Boom tent and aft deck cover, Cockpit cushions, back-rests and aft seating cushions. 3 queen size ensuite cabins. Leather seating in saloon. 2 x reclining lounge chairs in saloon. All hatches and ports with Ocean Air curtains. 4 x including cockpit, all H+C. 3 x heads with fresh water flush. 12V electric flush in owners cabin with Tecma vacuum. 3 x Climma reverse cycle air conditioning systems (Service June 2017). Dual entry refrigerator with Separate freezer. 3 burner stove and oven. Microwave. Spectra Catalina 300 desalinator (about 45l/hour). Fold out anchor system, 27kg anchor with 60m stainless chain marked every 10m, Secondary 27kg anchor with 10m chain and 50m rope. All requirements to AYF Category 5 minimum, 2 x RFD 4 man life rafts, 15 life jackets, EPIRB with GPS feed capability, Jackstays, Fire extinguishers in owners cabin, saloon and garage, Gas detector system in galley. Dewalt cordless angle grinder, Engine room fire/sound insulation replaced 2016, Emergency tiller in garage. 12v bilge pump with roving hose to reach any space onboard. Emergency bilge pump in cockpit. Batteries: 240AH 24v battery bank for hydraulics in garage with 60 amp chargers, 900AH 12v house bank plus engine start battery separate. 2 x 60 amp chargers, Xantrex 1800i sine wave inverter, Separate shore power and air-con power inlets (each 15 amp). Hella sealed LED navigation light, Windex light LED, Spreader lights LED, Boom/Cockpit light LED. Nav station - 9" touch screen GPS. B&AP Simrad drive and B&G head unit. Compass in cockpit. B&G H5000 system (last software update March 2017), B&G "Go Free" wireless network with 3D motion sensor. AIS system from either touch screen. On deck - Mast maxi gauges x 4,12" touch screen GPS, Autopilot control (can also be access via touch screens), Multifunction displays x 3. 2014 Hood Lightskin Carbon main. 2014 Hood Lightskin Carbon 110% genoa. 2014 Hood Lightskin Carbon self tacker. A2 0.75 oz (280m) in retrieval sock, A2 0.75 oz (220m) in retrieval sock, Code 0 (150m). Delivery Sails - Carbon Main (85m), Carbon Self tacking jib (60m), Dacron Self tacking jib (60m), Dacron #4 jib. Double swept Carbon fractional rig. Carbon Park avenue boom. Rod rigging. PBO back stay to two Reckmann hydraulic rams, Reckmann hydraulic boom vang, Bowsprit 1400mm Carbon (2015). All custom made halyards and sheets (2016). Halyards have colour changed in cover as full hoist is approaching/achieved, 2:1 Main halyard, Jib Halyard, 1:1 masthead spinnaker halyard, 2:1 masthead spinnaker halyard, 1:1 hounds (forestay) halyard, Single line reefing (2 reef points), 2:1 outhaul, Cunningham back to cockpit, 2:1 tack to bowsprit, Jib sheets, Main sheet, 10mm spinnaker/Code 0 sheets, 8mm spinnaker sheets, Endless furler for Code 0, Code 0 furler is Profurl NEX 5.0 (200mm diam), Profurl jib furler, Cousin/Ronstan constrictor clutches (5 port, 5 starboard) Hydraulic transom door/garage with 2 x remote controls, Life raft mounts under aft seating. Mainsheet to 'pod' in cockpit (Harken 70ST hydraulic), Primary winches (2 x Harken 60ST hydraulic), Secondary - spinnaker winches 2 x Lewmar 54ST), Furling winch (Harken ST46 hydraulic), Tack winch Lewmar 46ST, Swim ladder, Cockpit table (removable, for use at anchor - sits onto main sheet winch). Hydraulic systems controlled with 2x 1.3kW, 24v pumps serviced April 2017, Stainless steel gas bottles x 2 (located in anchor locker). Sail locker has outboard mount under steps. Antifoul stripped to primer and replaced June 2017 (Altex #5 with bright red around rudder area - aluminium rudder stock removed and inspected 2016).